The questions that buyers of garden sheds in the UK come up with before they finally decide for a certain model are mostly always the same. One question is, of course, always decided before the other questions arise, and that is the question of what to use the garden shed for. A certain need is the trigger for the whole idea of purchasing a garden shed. Mostly it has to do with limited space in the house and if the garden offers enough space, here you are! Space to store things, space for a home office, space to have a proper centre for the gardening, space for a workshop, a studio, a garden sauna with spa, a playhouse for the kids, a guest room, a lounge, a man-cave, you name it. Needs to become active for one’s health can trigger ideas about meditation retreats, garden fitness centres, or hot tub cabins. 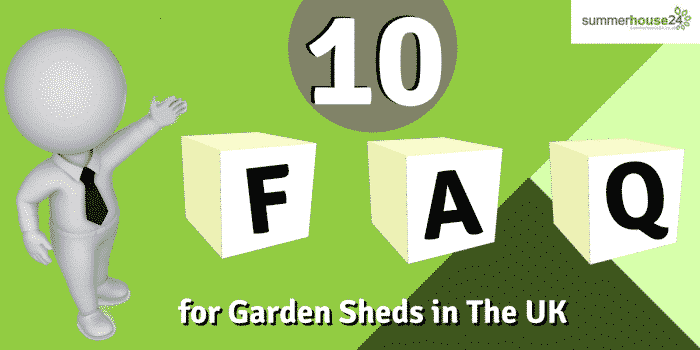 We have compiled the 10 most common questions of future buyers of garden sheds in the UK for you in the following article. Question – Would it be better to build the shed myself? Garden sheds in the UK are mostly offered by professional manufacturers that offer a superb quality for relatively low prices. So the answer would in most cases be: No! Plans and blueprints are there and logs and parts are quickly manufactured in large factories by very exact working machinery running with computer aided design. This results in a product with a much higher quality with much less effort and costs than you could ever compete with as a simple DIY-er. There is a really enormous range of different models, designs, sizes, and materials for garden sheds in the UK. So it will nearly never happen that you can’t find exactly the right model for you planned purpose. Question – Which model would suit my purpose best? Garden sheds in the UK are offered in so many varieties that it might be useful to take a moment to think about the general features a garden shed for your intended purpose must have: A modern design with large floor to roof windows, flat roofs, and covered terraces might be good for an artist’s studio with much natural light inside, for a garden lounge, or it might represent your young company for customers and business partners as a neat garden office. A garden shed without windows or with just small ones can also be good as an office, if you like to be secluded to concentrate on your work. Storage does not necessarily need windows at all. A garden shed for gardening tools might not even need a floor, but large double doors could be good and you might even look for wooden garages if you are planning a workshop or a logistical centre for gardening. In short: Imagine, what you want to do in or with your garden shed and define some key features. That does not mean that you should burn all bridges for a later evolution of usage. Experience shows that this quite often happens with garden sheds. Question – Can I change some features of models from the internet? As wide the range of models of garden sheds in the UK is, it still may happen that you have found your perfect model but just two or three things should be slightly different. One window more or less, floor boards just 10 millimetres thicker, or just 15cm more head space? Try to talk about it with the manufacturer. In many cases these kinds of extra requirements can be met for just a little surcharge, sometimes just covering costs for added materials. Question – Can I use a garden shed for multiple purposes? Of course, you can! As a matter of fact, a multi-purpose usage is the normal case, and it would be good to be aware of it from the start. It is just unrealistic to assume a large, dry, and save wooden garden shed could be in the garden without someone storing things from the garden there, that seem to have no better place. Be it toys, gardening tools, some vegetable harvest, a football, a water hose or whatever. Only very few, very rich people really do have more space than they can use. For all the rest of us, a safe space like a garden shed will be used in multiple ways. Please note, that we also offer garden buildings that combine a garden room with a garden shed under the same roof. Considering sparing expenses, such a solution would surely be more affordable than two separate buildings. Question – Do I need a planning permission? There are a number of regulations concerning this question. For example if your garden shed will be less than two metres away from the boundary, it can have a maximum wrist height of just 2.5 metres. If it is two metres or more to the boundary, it might have a wrist height of up to four metres to not need a planning permission. A garden shed that is nearer to the street than the main house will need a planning permission. And so on. To be sure, you would best contact your local building authority to discuss your plans with them. Some more rules are also mentioned in this article. Question – How to get good quality? With the huge choice of products of garden sheds in the UK, you might worry if all the offers have a good quality and how much price is a factor in it. Our advice would be to stick with renowned manufacturers who have some experience/tradition and who also provide some years of warranty on their products. Warranty also ensures that the manufacturer have good constructions to sell which have no problems from shrinking or forming cracks or gaps because during the years of warranty they will inevitably be forced to solve such problems. Another advice would be just to avoid cheap quality. If you order a garden shed for several hundred pounds, it should at least have real glass for the windows instead of plastic and a solid cylinder lock for the door. Look for the little things. If you find quality there, it is likely to find quality elsewhere, too. Question – Where should the garden shed go? Garden sheds have the properties to become completely autonomous buildings, but they can as well be connected to the infrastructure of the main house. Depending on the use for the garden shed, you may want to be close to the house or as far off as possible, secluded and surrounded by nature, tranquillity and bird song. Just be aware that the place may be a factor in the planning permission requirements. Question – Do I need a foundation and if yes, what kind? We recommend foundations for all of our garden sheds. In the UK the weather is often wet and it is crucial for the lifespan of any wooden garden building to be protected from water from below properly. Foundations can be as easy as a few building stones and as sophisticated as a foundation plate on a properly drained ground. If you need some advice on foundations, please read our article about it. Question – Should the garden shed be insulated and heated? For all purposes that require spending some time in it and are not confined strictly to summer activities, our answer would be: Yes! Compared to a mere summer house in the original sense, you can more than double the value of the garden shed for yourself by doubling the time that you can use it. To find out some easy ways to do that, please read our article on insulating garden sheds and heating options for garden sheds in the UK. Question – Does my insurance cover the garden shed? Of course, it does. Just check out your home insurance and make sure it also covers the contents of the garden shed. If you have electricity in the garden shed, you will need to be able to prove that it has been installed by a certified electrician. Contrary to common belief, fire insurance will not be more expensive for wooden garden sheds than it would be for stone buildings.